A Spanish or French dessert. Some even said Cuban. Whatever the arguments are, caramel flan is famously known to contain lots of egg yolks to give it a smooth, almost cream cheese like texture. Coupled with the condensed milk (not one can, some recipe called for 4 cans!). 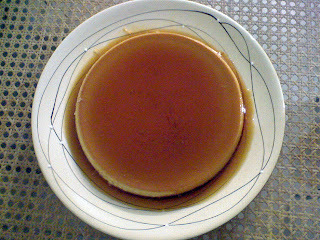 Here is a version of caramel flan that consist little egg yolk and uses no condensed milk nor evaporated milk. In fact, it uses ice cream as one of the ingredient to give it the smooth texture. It tasted awesome. The caramel part is a lot of pain but practice makes perfect. Enjoy! Start off by caramelizing the 1 cup of sugar. In a deep already hot pot, pour the sugar in. Maintain medium heat. Stir with a wooden spatula (wooden ones preferred over metal, wood works best with sugar in my personal experience). Leave it for about 5mins and don't stir anymore. When the sugar starts to melt, stir it again and stop. When all sugar melted and turned brown, give the pot a good shake or tilt to maintain even melting of sugar. When it turns to a deeper brown, stir it once till even and turn off the fire. Do not let it burn and BE CAREFUL. Sugar at this temperature is very very very hot. Working quickly here, pour all the caramel into an 8'' round pan and tilt it till it is evenly coating the bottom and a little of the sides of the pan. Bring this to a boil again over medium heat until small bubbles form at the edges of the pot. Remove from heat and let it cool down a little on a soaking wet tea towel making sure to stir it occasionally. Stir in the vanilla extract and set it aside. Whisk Portion B till until pale and creamy, achieving the ribbon texture. Ribbon texture is when you lift the whisk and try to write number '8' on the surface of the mixture, the number '8' will be visible for bout 5seconds before disappearing. Stir in about 1/3 of the milk mixture into Portion B and stir vigorously. Temperating is very important and cannot be skipped. If you are impatient and stir in all the milk mixture into Portion B, you might end up cooking the eggs. Next, stir in the milk-egg mixture into the pot containing the rest of the milk mixture. Stir till well mixed and pour this into the prepared pan BY PASSING IT THROUGH A STRAINER. Placed the round pan into a larger roasting pan (any size really does not matter) and pour hot water until it comes 1/2 way up the round pan. Bake for 1 hour, no more, no less. Cool it at room temperature and then refrigerate overnight. Do not attempt to invert while it is still hot. When serving, run a wet knife all around the edge of the flan and invert it. Remember to scrap out all the goodness caramel! 0 comments on "Caramel Flan"